Augmented World Expo (AWE) is the world's largest conference and expo focused on Augmented Reality, Virtual Reality and Wearable Technology. The events take place in the USA, Europe and China and are produced by the non-profit organisation AugmentedReality.Org. that facilitates the global and regional transformation of the AR industry by educating about AR and connecting the best talent with the best in AR. 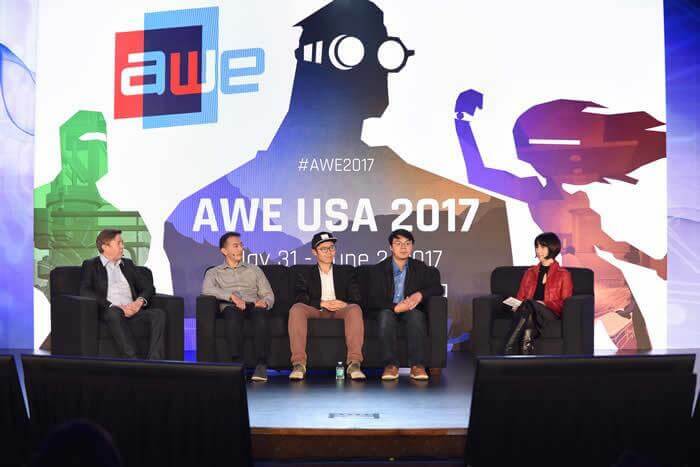 AWE gathers the top innovators to present the best augmented world experiences. AWE 2016 was said to be the largest exposition of Augmented Reality, Virtual Reality and wearable technology. AR and VR are bringing change to the people and this year they aim to highlight how to use these Superpowers to Change the World. They will present speakers and organisation that are using AR and VR to drive economic growth and will focus towards promotion of sustainability. AWE focuses on learning about leading SDKs and practices that enterprises should adopt, along with providing demo showcasing AR, VR and wearable tech, inspiring you by industry luminaries and top innovators along with investor forum and Auggie Awards. AWE USA 2017 held at the Santa Clara Convention Centre showcased Consumer Pavilion featuring through branding, marketing and socializing, Enterprise Pavilion, Interact Pavilion featuring eye-tracking, controllers, haptics and other methods to interact in this new wave of computing and Tool Pavilion that features 3D capture tools, SDKs, computer vision platforms and other companies equipping developers and designers with the tools they need to create in AR/VR. AWE Asia is scheduled on 19-21 July at Beijing, China, the event is co-produced by ARA (the Augmented Reality China Association). It pushes forward the AR/VR application and industries development through exhibition and forums by building a capital connection platform from the field of enterprises to move towards advancement. AWE returns to Europe in Munich, Germany on October 19-20, 2017 at the MOC Exhibition Center.